There is an urgent need for structurally novel anti-norovirus agents. In this study, we describe the synthesis, anti-norovirus activity, and structure–activity relationship (SAR) of a series of heterocyclic carboxamide derivatives. Heterocyclic carboxamide 1 (50% effective concentration (EC50)=37 µM) was identified by our screening campaign using the cytopathic effect reduction assay. 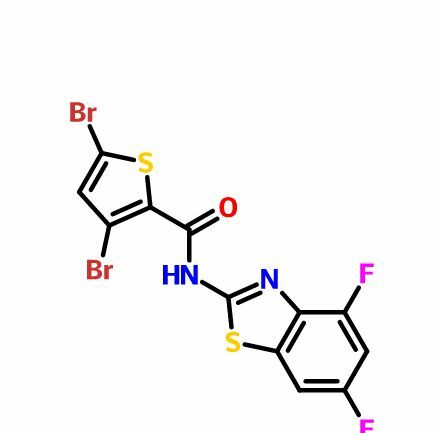 Initial SAR studies suggested the importance of halogen substituents on the heterocyclic scaffold and identified 3,5-di-boromo-thiophene derivative 2j (EC50=24 µM) and 4,6-di-fluoro-benzothiazole derivative 3j (EC50=5.6 µM) as more potent inhibitors than 1. 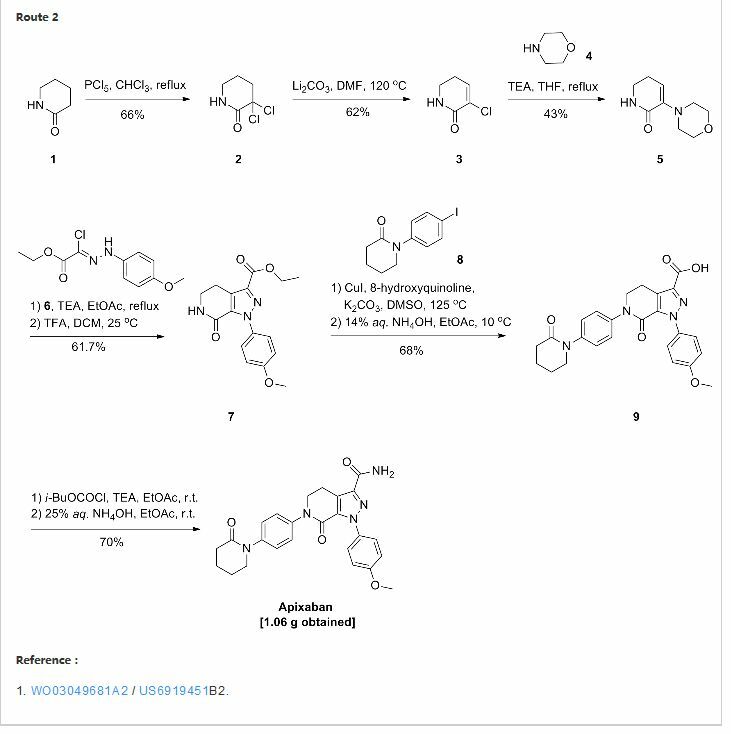 Moreover, their hybrid compound, 3,5-di-bromo-thiophen-4,6-di-fluoro-benzothiazole 4b, showed the most potent anti-norovirus activity with a EC50 value of 0.53 µM (70-fold more potent than 1). Further investigation suggested that 4b might inhibit intracellular viral replication or the late stage of viral infection. According to the same procedure used for 2f, starting from 3,5-dibromothiophene-2-carboxylic acid (286 mg, 1.00 mmol) and 4,6-difluorobenzo[d]thiazol-2-amine (204 mg, 1.10 mmol), 4b (270 mg, 60%) was obtained as white powder. mp: 245–246°C. 1H-NMR (DMSO-d6) δ: 7.43 (1H, dt, J=10.2, 2.0 Hz), 7.56 (1H, s), 7.83 (1H, dd, J=8.4, 2.0 Hz). 13C-NMR (DMSO-d6) δ: 102.2 (dd, J=28.0, 23.1 Hz), 104.7 (dd, J=26.4, 3.3 Hz), 114.3, 118.4, 131.4 (d, J=7.4 Hz), 134.3 (d, J=10.7 Hz), 134.9, 135.2, 152.7 (d, J=241.2, 20.7 Hz), 158.3 (dd, J=242.2, 10.7 Hz), 159.0, 159.7. HPLC purity: >99%, ESI-MS m/z 453 [M+H]+. a) EC50 was evaluated by the CPE reduction assay. 280 TCID50/50 µL of MNV and a dilution series of each compound were incubated for 30 min. The mixture was exposed to RAW264.7 cells for 1 h (in duplicate). b) Cytotoxicity was evaluated by the WST-8 assay. 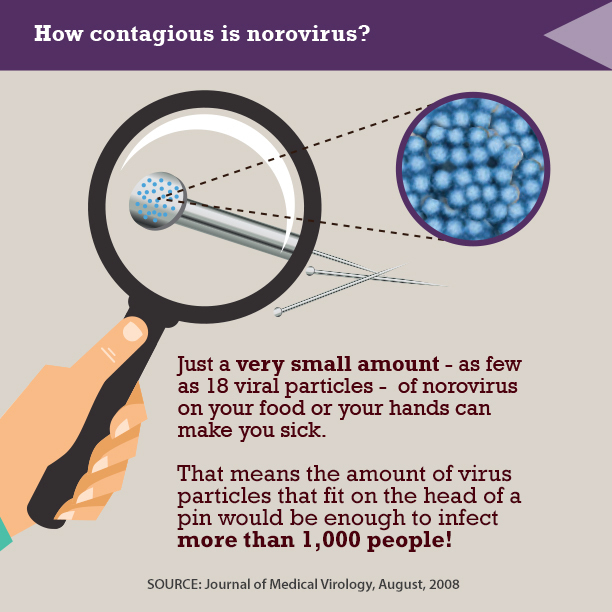 RAW264.7 cells were treated with dilution series of each compound (in triplicate) for 72 h.
Norovirus is a contagious virus that affects many people each year. 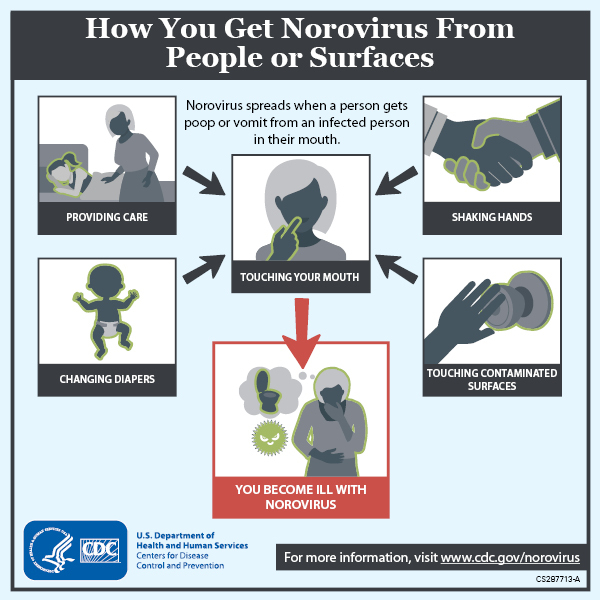 You can get norovirus through interaction with an infected person, by eating contaminated food, touching contaminated surfaces, or drinking contaminated water. However, there are ways to kill norovirus before it infects you. To do this, you will have to maintain personal hygiene and keep your home contamination-free. You have come into contact with someone who has norovirus. Before and after you interact with someone with norovirus. If you visit a hospital, even if you don’t think you interacted with anyone with norovirus. After going to the bathroom. If you are a nurse or doctor, wash your hands before and after coming into contact with an infected patient, even if you wear gloves. Avoid cooking for others if you are sick. If you have been infected and are sick, do not handle any food or cook for others in your family. If you do, they are almost certain to get the infection too. If a family member is contaminated, do not let them cook for anyone else. Try to limit the amount of time healthy family members spend with the sick family member. Wash your food before eating or cooking it. Wash all food items such as meats, fruits and vegetables thoroughly before consumption or for use in cooking. This is important as norovirus has the tendency to survive even at temperatures well above 140 degrees Fahrenheit (60 degrees Celsius). Remember to carefully wash any vegetables or fruit, before consuming them, whether you prefer them fresh or cooked. Cook your food thoroughly before eating it. Seafood should be cooked thoroughly before eating it. Quick steaming your food will generally not kill the virus, as it can survive the steaming process. Instead, bake or boil your food at temperatures higher than 140F (60C) if you are concerned about it’s origins. If you suspect any kind of food of being contaminated, you should dispose of it immediately. For instance, if a contaminated family member handled the food, you should either throw the food out or isolate it and make sure that only the person who already has the virus eats it. Use bleach to clean surfaces. Chlorine bleach is an effective cleaning agent that kills norovirus. Increase the concentration or buy a new bottle of chlorine bleach if the bleach you have has been open for more than a month. Bleach becomes less effective the longer it remains open. Before applying bleach to a visible surface, test it somewhere that is not easily seen to make sure that it won’t damage the surface. If the surface is damaged by bleach, you can also use phenolic solutions, such as Pine-Sol, to clean the surface. There are certain concentrations of chlorine bleach you can use for different surfaces. For stainless steel surfaces and items used for food consumption: Dissolve one tablespoon of bleach in a gallon of water and clean the stainless steel. For non-porous surfaces like countertops, sinks, or tile floors: Dissolve one third of a cup of bleach in a gallon of water. For porous surfaces, like wooden floors: Dissolve one and two thirds of a cup of bleach in a gallon of water. Rinse surfaces with clean water after using bleach. After cleaning the surfaces, leave the solution to work for 10 to 20 minutes. After the time period elapses, rinse the surface with clean water. After these two steps, close off the area, and leave it like that for one hour. Leave the windows open, if possible, as breathing in bleach can be hazardous to your health. Put disposable gloves on. Consider wearing a facemask that covers your mouth and nose as well. Using paper towels, gently clean the vomit and feces. Be careful not to splash or drip while cleaning. Use disposable cloths to clean and disinfect the entire area with chlorine bleach. Use sealed plastic bags to dispose of all the waste materials. Wear disposable gloves if you can while cleaning the carpets. You should also consider wearing a facemask that covers your mouth and nose. Use any absorbent material to clean all the visible feces or vomit. Place all contaminated materials in a plastic bag to prevent aerosols from forming. The bag should be sealed and put into the garbage can. The carpet should then be cleaned with steam at 170 degrees Fahrenheit (76 degrees Celsius) for about five minutes, or, if you want to save time, clean the carpet for one minute with 212 degrees Fahrenheit (100 degrees Celsius) steam. Remove any traces of vomit or feces by wiping it away with paper towels or a disposable absorbent material. Put the contaminated clothing into the washing machine in a pre-wash cycle. After this stage is complete, wash the clothes using a regular washing cycle and detergent. The clothes should be dried separately from the uncontaminated clothes. A drying temperature exceeding 170 degrees Fahrenheit is recommended. Do not wash contaminated clothing with uncontaminated cleaning. Fever. Just like in any other infection, the norovirus infection will cause fever. Fever is a way in which the body fights infection. The body temperature will rise, making the virus more vulnerable to the immune system. Your body temperature will most likely rise above 100.4 degrees Fahrenheit (38 degrees Celsius) when suffering from a Norovirus infection. Headaches. High body temperatures will cause blood vessels to dilate in your entire body, including your head. The high amount of blood inside your head will cause pressure to build up, and the protective membranes covering your brain will suffer inflammation and become painful. Stomach cramps. Norovirus infections usually settle in the stomach. Your stomach may become inflamed, causing pain. Diarrhea. Diarrhea is a common symptom of Norovirus contamination. It occurs as a defense mechanism, through which the body is trying to flush out the virus. Vomiting. Vomiting is another common symptom of an infection with Norovirus. Like in the case of diarrhea, the body is trying to eliminate the virus from the system by vomiting. Understand that while there is no treatment, there are ways to manage symptoms. Unfortunately, there is no specific drug that acts against the virus. However, you can combat the symptoms that the norovirus causes. Remember that the virus is self-limiting, which means that it generally goes away on its own. The virus generally lasts for a few days to a week. Drink lots of fluids. Consuming a lot of water and other fluids will help to keep you hydrated. This can help to keep your fever low and your headaches to a minimum. It is also important to drink water if you have been vomiting or have had diarrhea. When these too symptoms occur, it is very likely that you will become dehydrated. If you get bored with water, you can drink ginger tea, which may help to manage your stomach pains while also hydrating you. Consider taking anti-vomiting drugs. Anti-emetic (vomit-preventing) drugs such as ondansetron and domperidone can be given to provide symptomatic relief if you are vomiting frequently. However, keep in mind that these drugs can only be obtained with a prescription from your doctor. By DR ANTHONY MELVIN CRASTO Ph.D in Uncategorized on June 7, 2016 .